Global fluoropolymer films market expected to reach USD 3.07 billion by 2025, at a CAGR of 5.8% between 2019 and 2025. 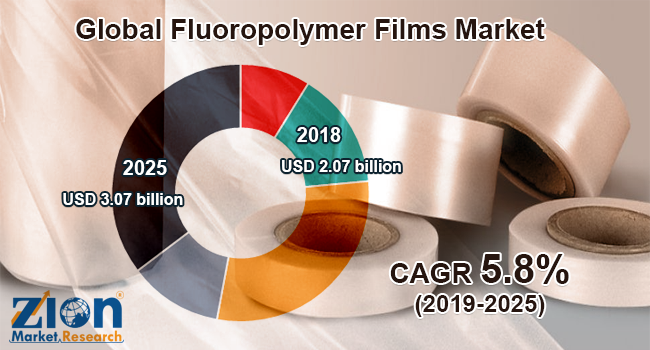 The fluoropolymer films market is expected to grow significantly in the upcoming years, owing to the rising application of fluoropolymer films in several end-user industries. The report covers a forecast and an analysis of the fluoropolymer films market on a global and regional level. The study provides historical information for 2016, 2017, and 2018 with a forecast from 2019 to 2025 based on both volume (Kilotons) and revenue (USD Billion). The complete study covers the key drivers and restraints for the fluoropolymer films market. It also provides the market impact within the forecast period. Furthermore, the study also includes the opportunities accessible within the fluoropolymer films market on a global level. In order to offer the users of this report, a comprehensive view of the fluoropolymer films market, we have enclosed a detailed value chain analysis. To know the competitive landscape within the market, an analysis of Porter’s Five Forces model for the fluoropolymer films market has additionally been enclosed within the study. The study includes a market attractiveness analysis, wherein all segments are benchmarked supported their market size, growth rate, and general attractiveness. The study also includes the market share of the key participants operating in the fluoropolymer films market across the globe. Besides, the report covers the strategic development together with acquisitions & mergers, agreements, partnerships, collaborations, and joint ventures, and growth of key players within the market on a regional basis. The study provides a crucial view of the fluoropolymer films market by segmenting the market based on type, application, and region. All the segments have been analyzed based on present and future trends and the market is estimated from 2019 to 2025. By type, the global fluoropolymer films market includes polyvinylidene fluoride (PVDF), perfluoroalkoxy alkane (PFA), polytetrafluoroethylene (PTFE), fluorinated ethylene propylene (FEP), and ethylene tetrafluoroethylene (ETFE). By application, the global fluoropolymer films market includes industrial, electrical and electronics, medical and pharmaceutical, automotive and aerospace, consumer products, and others. Additionally, the regional classification includes Europe, North America, Latin America, Asia Pacific, and the Middle East and Africa. These regions are further divided into major countries, such as the U.S., UK, Germany, Canada, France, China, Japan, and Brazil, among others. Some key manufacturers of the global fluoropolymer films market are DAIKIN INDUSTRIES, Ltd., DuPont, Dyneon GmbH, AGC Chemicals Europe, Ltd., 3M, Solvay Solexis, Honeywell International Inc., Shanghai 3F, Gujarat Fluorochemicals Ltd., Fuxin Hengtong, Zhonghao Chenguang Research Institute of Chemical Industry, and Jinan 3F Fluoro-Chemical Co., Ltd., among others.